Part 3 in a series. For Part 1 with Dovid Gabay, click here. For Part 2 with Eli Gerstner, click here. Cantor Netanel Hershtik is easily one of the most fascinating personalities in all of Jewish Music. He is a fourteenth-generation chazzan (how many people on this planet can say that they are the fourteenth-generation anything? ), whose father, Cantor Naftali Hershtik, is the former chazzan at the Great Synagogue in Jerusalem. Hershtik trained as a chazzan at the Tel Aviv Cantorial Institute, and is currently the official chazzan at the Hampton Synagogue in Westhampton Beach, New York. He has been the featured chazzan on multiple Kosherica cruises, and he has performed at many of the world’s most prestigious venues, including the Sydney Opera House and the United Nations. He also served in the IDF, and graduated law school—twice! Shimon Simpson: You are from a long line of chazzanim. At what point in your life did it become obvious that you were going into the family business? Netanel Hershtik: Very late. Even though I sang from age 4-13 in concerts and shabbosim, only as an adult did I realize that I am a chazzan when I formed a choir to accompany other chazzanim (to pay my bills and student loans); sometimes I was pushed to the amud as a replacement for the sick chazzan…It was barshert. SS: Did being a musician get you any special treatment (good or bad) in the IDF? NH: I chose not to join the IDF band and instead joined the Nachal Brigade to be a combat medic. I was interested in this type of service. There is a lifetime to do music but one opportunity only to do what I did in the Israeli army. SS: Your biography on the Hampton Synagogue website says that you recently completed your LLM [i.e., an advanced degree on top of a regular law degree]. When exactly do you have time for other things, like, you know, sleep? SS: This past summer, you performed as part of the “Five Cantors” in Central Park. What was that like, and will we be seeing more of this particular group together? NH: Yes, there is an intention by the organizers to repeat this event (details to follow). It was a great concert and an awesome blend of personas and styles on one amazing stage. SS: Getting to the new album: How did you go about selecting songs for this album? There are selections from davening (“Umipnei Chataeinu”), Yiddish classics (“Moishele”), modern selections (“Tanya”), and a track featuring the Maccabeats (“Havdalah”)—quite a variety. NH: It’s who I am, I love including different styles—otherwise I get bored. It’s crucial for chazzanut to be more inclusive and accessible. At the Hampton synagogue we do all the above mentioned styles plus many more (even blues, pop and gospel), while retaining the most authentic traditions. But everything must be updated and maintained. SS: In my opinion, a great part of chazzanus albums is the fact that the music is almost always provided by a full orchestra, and that is true for your album as well–of course, excepting the last track, which features the Maccabeats instead of music. NH: Actually, that’s true only for the first half of the song which could be seen on the clip (https://www.youtube.com/watch?v=5Y9jPvnV5B8). SS: It’s funny–I hadn’t realized there were actually instruments in the “Havdalah” track until you pointed them out–the Maccabeats sound so much like instruments that I couldn’t tell the difference. SS: …However, Shabbos and Yom Tov davening, where a chazzan actually earns his living, is obviously without music. Is it hard to adjust from a studio/concert environment to a davening environment? NH: I am spoiled, I have the best male choir in the US (and maybe worldwide) every Shabbat. Working with Maestro Yitzhak Haimov every Shabbat is a pleasure and the high holidays are no exception. Also, I must say that my chazzanut recording is one of the first in our generation to have new arrangement and recorded live. Most orchestras you hear in other chazzanut recordings are IMC productions, which as lovely as they may be, they are not recorded with the cantor live but as a playback later, so the same exact accompaniment [to] the same piece will be heard on several recordings. I recorded my album live in Avatar Studios (NYC’s premiere studio) with 55 musicians. This album features new arrangements by several top musicians to enhance the colors and flavors and to give new interpretation to the old and present the new pieces in a modern and fresh approach. It was much more expensive and time consuming doing it this way but it is also rewarding. Lefum tzaara agra. SS: Besides for your own choir at shul, who are your favorite artists to perform with? NH: It’s always a pleasure and a privilege to sing with the “titans” such as [Avraham] Fried or [Chazzan Y.M.] Helfgot. Singing with my father is always special. Also singing with some younger artists, such as Yanky Lemmer, Simon Cohen or IDF cantor Shai Abramson is a pure pleasure. Dr. Mordechai Sobol and his son Ofir and the Israeli Philharmonic are also career highlights. And how can I forget veteran accompanists such as Danny Gildar and Raymond Goldstein… The list gets longer and longer. Each musician brings different flavors and so the collaboration is an opportunity for a new harmony. SS: Who would you like to perform with that you have not yet had the opportunity to? NH: Many artists—but Yossi Green, MBD, and Yaakov Shwekey would be an awesome gig :), as well as many artists outside of the Jewish music, classical musicians, opera or Broadway singers, choirs, orchestras, jazz artists…I would love to explore all these options B”H. SS: What other chazzanim do you listen to? How about other artists (Jewish or otherwise)? SS: What is it about chazzanus as a genre that makes it special compared to the rest of the Jewish Music scene? Alto saxophonist and composer Ornette Coleman, one of the last of the truly imposing figures from a generation of jazz players that was full of them, seldom talks about other people’s music.…Coleman’s first request was something by Josef Rosenblatt, the Ukrainian-born cantor who moved to New York in 1911 and became one of the city’s most popular entertainers — as well as a symbol for not selling out your convictions. (He turned down a position with a Chicago opera company, but was persuaded to take a small role in Al Jolson’s film “The Jazz Singer.”) I brought some recordings from 1916 and we listened to “Tikanto Shabbos,” a song from Sabbath services. Rosenblatt’s voice came booming out, strong and clear at the bottom, with miraculous coloratura runs at the top. I think Coleman (OBM) said it better than me—and, by the way, he passed away last year on the same day as Yossele’s yartzeit. Freaky. SS: On a related note, how can chazzanus become more popular among “mainstream” Jewish Music fans? NH: I think Helfgot has helped a lot in this. The magnitude of his amazing gift from Hashem, his voice, has brought chazzanut to many new listeners. I don’t know that chazzanut should be mainstreamed. It is an acquired taste and it requires much more attention in listening than just background music. It’s deep, as opposed to pop. It asks you to stop talking in shul and listen (for a change). It asks you, like learning deep Torah, to stop your output and invest a bit in the input. Just like classical music or jazz, it’s rewarding the soul and mind of the listener 10 times more than pop. Its art not entertainment. The level and amount of interest in art in our society reflects greatly on who we are and how much we are able to listen and receive deep messages, it’s an indication to how sensitive can we really be to different frequencies or how truly spiritual can we get. Thanks again to Cantor Hershtik for his time and answers to my questions. 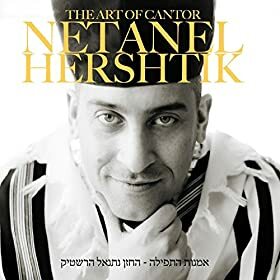 The album The Art of Cantor Netanel Hershtik is available for purchase on iTunes, Amazon, and Google Play.